Ok, so I was bitching about how crappy I thought these would be and blah blah blah, you know the drill. This time I decided to see if they were actually as bad as I had thought. I haven't worn them yet, but they actually don't seem so bad. They could be a lot more pigmented, but the colors are much better than they looked in the pictures. The outer packaging was especially nice- it felt almost like a luxury product. 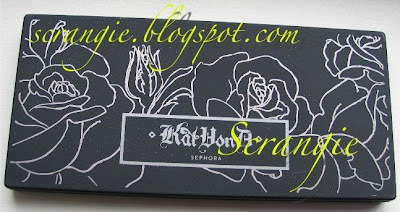 The beautiful outer box that opens to reveal artwork inside, the special gunmetal wrapping paper with the Kat Von D seal. They were really trying to make a good impression. Seriously, people. View the larger images. I intentionally left them huge. Top (indoor lighting): Galeano, Leather, Rad Purple, Sinner, Tequila, Raxor Gray, Speed Blue, Lucifer. Bottom (outdoor, full sunlight) same as top, just reverse order. Outside, full sunlight. Leather, Baroque, Downtown, Clay, Tequila, Dimebag, Orbi, Lucifer. I like how they included two double-ended brushes instead of sponge-tip applicators. The downside is that the texture of the brushes is more like a lip brush and unlikely to pick up much pigment. They're tiny and way too smooth. Overall, they're much nicer than I thought they would be. I'm going to use them and then give a final review.